Article 8 of the Decision outlines the rules for selecting projects. For non-CCS projects, step one is, within each subcategory, to identify the highest-ranking proposals. These are the proposals with the lowest “ranking cost” per total amount of energy that the proposed project will produce over the first 5 years of operation, a quantity known as “CPUP”. A plausible definition of “ranking cost” is given in this slide. Next the combined total of the public subsidy requested by the 8 highest-ranking CCS proposals (called the “CCS Group”) and 34 non-CCS proposals (called the “RES Group”) is calculated. Where possible, to make up each Group, two proposals are drawn from each of the four CCS categories and one proposal from each of the 34 RES subcategories (details in the Procedures Manual Appendix A9). With each CCS project possibly costing as much as 2 bn EUR, the NER300 pot will very likely not be big enough to cover every (sub-)category, meaning a proportional cut will be made in the funding available for CCS and non-CCS projects (Procedures Manual Appendix A10). The only way in which NER300’s requirement for “technical balance” – the aim to demonstrate a wide range of renewable energy technologies – is implemented in practice is through the project deselection process. Within the RES Group, the proposal with the highest CPUP will be deselected first. Next, the proposal with the next highest CPUP from “a category other than where a deletion has been made” will be deleted (Procedures Manual Appendix A11), and so on until there is sufficient funding for the remaining projects. Possibly the most important is NER300’s implementation of Article 10a (8) of the revised Emissions Trading Directive’s requirement for “geographic balance”. Every Member State will get at least one NER300 project and the deselection rules will be bent to ensure this happens by allowing a Member State to propose a project below the capacity threshold stipulated in Annex I A. Appendix A of the procedures manual describes a method for topping up categories that lack eligible projects for every subcategory, but these proposals will be first in line for deselection in the deselection process. In the first Call, if less than three proposals are received for a subcategory, “the Commission shall assess possible impacts on the competition for selection” and may, “where appropriate”, choose not to fund a project in that subcategory. It is not expected that the EC will deem many (if any) subcategories to have failed this “Competitiveness Check”, but it if it did, the result would be that a replacement proposal would need to be chosen from another subcategory, as above. The Competitiveness Check is more relevant to CCS proposals than to renewable energy projects, for which existing Guidelines on State Aid for Environmental Protection lay down measures to take when competition is weak (see commentary below). The slideshow available below illustrates how the project selection process could be made to work. It is easiest to follow with the animations visible and with the notes accompanying the slides to hand. §102 to §104 of the Guidelines on State Aid for Environmental Protection say that with a “clear, transparent and non-discriminatory” competition for funding, a company can receive State Aid amounting to up to 100% of its relevant costs for its renewable energy project, but without such a competition, coverage of relevant costs to between 60-80% is still possible depending on the company’s size. 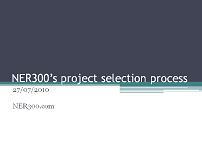 Rather than roll a project over to the next Call if too few proposals are submitted in a particular subcategory, it seems more logical to keep NER300’s rules consistent with the Guidelines and allow the project to receive money subject to the appropriate cap. NER300 can only cover up to 50% of relevant costs. In the current economic climate, governments seem unlikely to provide further investment aid to renewables projects even if they were allowed to. The Guidelines, written in 2008, are silent on CCS. Either the rules that apply to renewables should also apply to CCS or the first Call needs to specify that the option of rolling-over to the second Call applies only to CCS projects. The Commission might seek to create two groups of proposals, one containing projects that were selected for funding on the basis of a “clear, transparent and non-discriminatory” competition and another group containing those whose selection required the competition’s rules to be bent in some way. This would reduce the time it must spend on clearing proposals for compatibility with the Guidelines (see news story).